In 7.0.4.5 the green circle disappears sometimes if I have accessed Notes or other tabs, or if TheBrain has been inactive for a while. I then have to click with the mouse to get it back. As I am a keyboard only user, it would be nice to have this fixed. This seems to work in the Windows version. I'm not sure what "green circle" you are referring to. Can you please clarify or post a screenshot of the issue? Thank you. It's the green indicator that you can move with the arrow keys to access thougths. even though the color of this circle can vary depending on your theme and color options in Preferences. 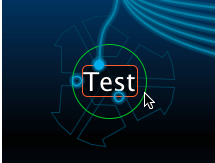 If this is the circle you are referring to, please make sure you have (Preferences > UI > Resizing circle is draggable) checked and please also note that the circle will not be green (or highlighted) unless you are hovering over it with your mouse pointer. No, it is the green navigator marker I mean. We're not exactly sure which circle you may be referring to. Can you send us or post a screenshot of the circle when it is properly appearing on your screen?